The small master bath in this beach cottage was ready for a makeover to compliment the rest of the home renovation. For very little money, the result was a completly new look. 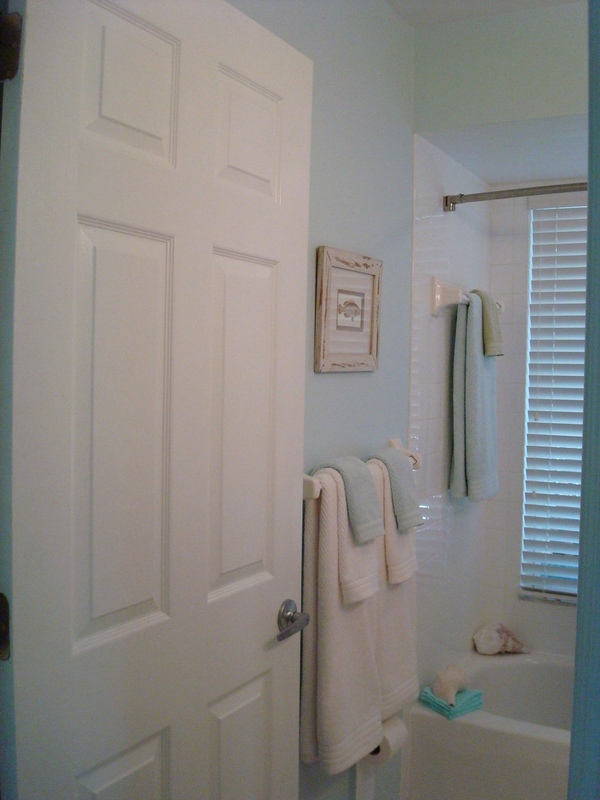 What we did: painted walls Benjamin Moore Sweet Dreams (847). Installed a curved hotel shower curtain rod and white waffle curtain. Added new white hotel towels and white rug. Rearranged accessories and added new artwork. Removed outdated light fixture and replaced with new fixture from Lowes. Installed white blind. Above the towel rack, added a 100-year-old, antique medicine cabinet found by the owner at the antique market in Mt. Dora. After minor restoration, it is a great addition to this room. The result: a beautiful small bath where every square inch counts.